The catches have been decent here and this Fort Lauderdale fishing report will hopefully be informative and helpful. The weather of course remains warm and showers are a way of life here this time of year. But along with the warmer days and possible daily showers are the calm to almost flat sea conditions which continue to be just that. Great conditions for Sworfish and they are being caught. The Mahi have returned the last couple of days, and some are in about 700 to 800 feet, and that puts them easily within our range. There are Mahi of course scattered about offshore of there as well, but it is nice to see them closer to shore than they have been. Expect some smaller ones but there are good fish as well. Chance for a Sailfish up on the reefs to way out in the deep, but their numbers have been fewer. 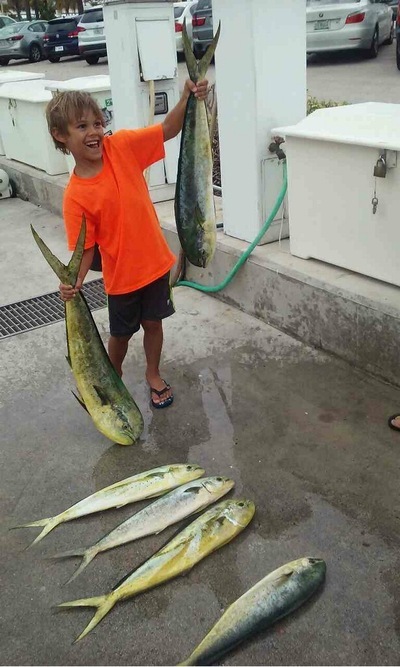 Some good keeper sized and above average Kingfish at the reefs. Off the edge there were once again Blackfins from 300 on out to 700 feet of depth. Skipjack Tunas @ 700 and deeper as well.